My plan had been to wake up early this morning; early enough to have a cup of coffee from my kitchen. Ideally, I wanted to be up sometime in the 6 o’clock hour. So things weren’t going well when I checked my phone this morning and it was already 7:10 a.m. Oh well. Just like the first day of first term, I wasn’t sure what would be on the schedule for today. Phil, Koa, and I had long discussions over the weekend about whether or not we would actually be teaching today. I, somewhat naïvely, assumed that classes would begin. Koa, somewhat cynically, assumed there would be no classes for the first week. We’ll split the difference. There were no classes today, but there will be classes tomorrow. 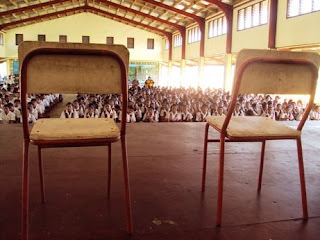 This morning began with an assembly, as I had predicted, but rather than starting second period, students cleaned classrooms for an hour and a half. Then we had interval like normal, and then the boys had a Boys Meeting, and the girls had a Girls Meeting. For students, the day seemed lax and easy. For teachers, things were a lot more hectic. Grades were due today for the test that students took at the end of last term. I was a little unclear on what I was expected to turn in. I made a spreadsheet listing a student’s name and his/her raw score. As it turned out, I was also supposed to rank students by individual class and then by grade level. I was also supposed to assign a score, 1 thru 9, based on a seemingly arbitrary schoolwide system (A score between 80 and 100 gets a 1, between 70 and 79 gets a 2, 61 and 69 gets a 3, etc.). I was under the impression we were turning these grades into the office where the secretary would do whatever a secretary does with grades. But by interval, I was getting hounded by teachers for my grades. I guess the homeroom teacher is responsible for aggregating a student’s grades. This was lousy because my digital gradebook had to be printed in order for it to be useful. 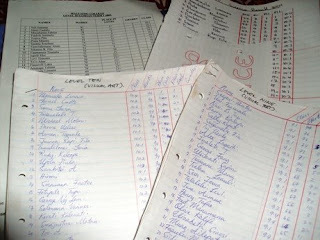 Also, once teachers got my grades, they copied them down, by hand, into their gradebooks. 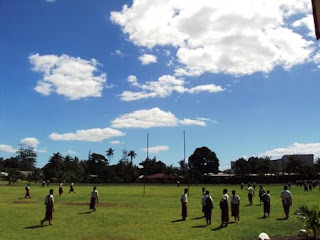 Faalau, the school secretary, was inputting grades into the computer, but she was doing it using tables in Microsoft Word. Seriously, the whole thing hurt my soul. So much time and energy would be saved using very simple Excel formulas. I could have a working prototype in less than an hour. The problem is I’m not entirely sure how to propose this. I put the school schedule into Excel, but that hasn’t really helped anybody. They still make changes to the schedule by hand and then have me input changes into the computer once the schedule is completed. To really make it worth it, the entire staff would need to input grades into Excel, which means the entire staff would need to learn at least cursory knowledge of Excel. This seems like it would be asking a lot, but I guess if I could show the benefit, they might be open to it. It would give me something to teach them, and I might seem more useful to them. Hell, even if we just had everyone record raw scores by hand, those numbers would be easy to input, and formulas would take care of the rest. On one hand, I feel like getting my school to use Excel and save countless hours of writing things out and entering redundant data is the reason I’m here. On the other hand, I feel like getting them to take this online will be an exercise in herding cats. I hope you had a great Monday. Pictures below. 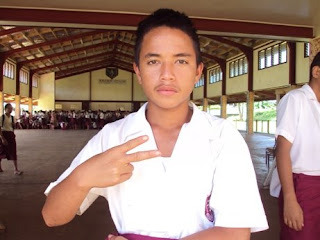 Esau, who is from Fausaga, mugging. i have made a goal to comment when there are "o comments". What Do You Do with a B.A. in Poli Sci?